Wolfram technology extends seamlessly across cloud and desktop, taking advantage of the best features of each environment. With the Wolfram Desktop Option, you install and run the native Wolfram Desktop system—connecting to the Wolfram Cloud only when necessary. Basic Wolfram Desktop Option stores all persistent files in the Wolfram Cloud; offline Wolfram Desktop Option also allows local file storage. With the Wolfram Desktop Option, you run the Wolfram Language on your local computer—so you have maximum local responsiveness, and maximum control over your computing environment. With Wolfram Desktop, you get instant responsiveness to interactive controls and other interface elements; there's no need to wait for network communication with the cloud. 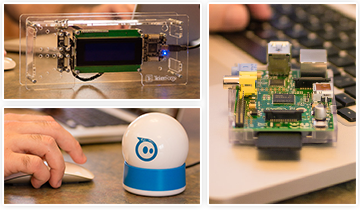 Cameras, microphones, and other connected devices are instantly accessible to the Wolfram Language in the Wolfram Desktop environment. Wolfram Desktop has built-in support for GPU computing with CUDA and OpenCL. 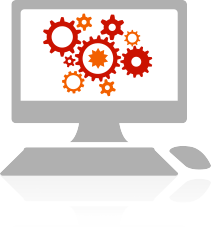 With the Wolfram Language on Wolfram Desktop, you can directly run and connect to any external program you want, using local interprocess communication or dynamic linking. The result of many years of development and polishing, Wolfram Desktop interface delivers a level of smoothness significantly beyond what can be achieved with today's web browser technology. In Wolfram Desktop, every interactive control is fully native to each platform, allowing a level of performance and familiarity not possible in a web browser. Wolfram Desktop has immediate access to any of the fonts and styles available on your desktop computer system—and is not limited to web fonts and styles. 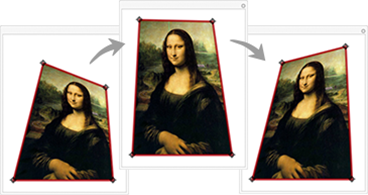 In Wolfram Desktop, everything in a notebook is immediately resizable and editable—with all reformatting and rerendering automatically taking place locally. Use a full set of carefully arranged native menus and command keys—without any possibility of interface from a web browser. Wolfram Desktop interface has been carefully tuned to fit in with the look and feel of each desktop operating system—as well as to support its latest controls and services. By making use of local native capabilities, Wolfram Desktop achieves a level of editing smoothness and agility beyond what is possible with cloud–based web–browser editing. Images, files, rich text: Wolfram Desktop lets you seamless copy, paste, and drag to and form other applications, and is fully integrated with native copy/paste/drag systems . In Wolfram Desktop, documentation can be stored locally, and is fully interactive and editable—allowing you to immediately change and rerun any example you want. The Wolfram Notebook Interface in the cloud is a feat of engineering—but there's still a lot that can be achieved only with the full native interface of Wolfram Desktop. The cloud can't respond fast enough to support full dynamic interactivity; but in Wolfram Desktop, it's easy to have real-time dynamic updating as a program runs, as well as things like dynamic image processing. Wolfram Desktop incorporates the world's most sophisticated fully automated mathematical typesetting system, with such features as automatic, mathematically aware linebreaking. 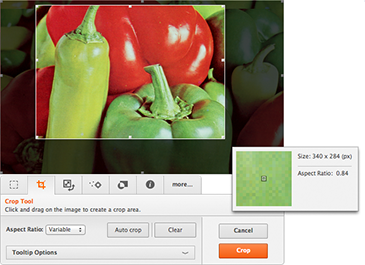 Wolfram Desktop has full support for floating, modal, and other palettes that can be placed anywhere on the screen, made translucent, and more. With Wolfram Desktop, you can set up custom style sheets for notebooks—and then use them both on the desktop and cloud. 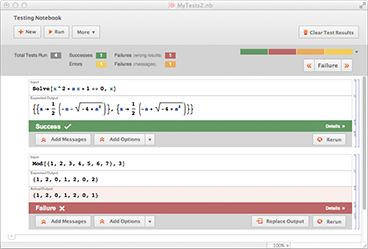 Wolfram Desktop includes a streamlined interface for creating and running arbitrary tests on code. In Wolfram Desktop, you can work in multiple simultaneous windows as well as using native palettes, dialogs, and more. Use Wolfram Language functions to control and modify notebooks even while they are displayed on the screen of the desktop system. With the native interface of Wolfram Desktop, you can directly edit 2D structures such as tables or superscripts as well as arbitrarily mathematical expressions. Put text inside code or code inside text with inline cells that define distinct local editing and rendering environments. Wolfram Desktop has built-in interactive drawing tools, as well as 2D and 3D image editing tools, and a wide range of native interactive wizards for complex common operations. Wolfram Desktop has well over a thousand detailed options that allow you to control the appearance and behavior of almost every aspect of its interface. With the Wolfram Desktop, you can take any notebook and turn it into a full-screen slide show ideal for presentations. When you use Wolfram Desktop, you get the best of both the offline and online worlds: responsive local interaction on the desktop, and breadth of capabilities and deployment in the cloud. Transparently to the user, Wolfram Desktop automatically determines whether an operation should be done locally or in the cloud. Wolfram Desktop is set up to allow instant access to files in the Wolfram Cloud—and from the standard Wolfram Cloud web interface, you can also open any file with the Wolfram Desktop. Unless you're dealing with external data, it's usually faster to run locally than in the cloud—so the Wolfram Desktop does this whenever it can. Wolfram Desktop is immediately connected to the full Wolfram Knowledgebase in the cloud—that powers Wolfram|Alpha and delivers real-time data, maps, and more. Wolfram Desktop has immediate access to the Wolfram Universal Deployment System in the cloud—so it can create APIs, forms, apps, etc., that are accessible across the web.